How do you feel about enchiladas? They’re our favorite, which you already know if you’re a regular at ABK! 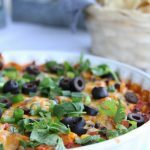 This Cheesy Chicken Enchilada Dip combines all of the flavors we love from enchiladas into an appetizer. I have, at last count 10 enchilada recipes on this blog. If you love enchiladas, this dip is going to be your new favorite appetizer. I personally made a meal out of this the last time I whipped it up. The Superbowl and March Madness are just around the corner. I’m going to let you in on a little secret. If you make great food, and if all else fails (e.g. your team loses) at least the food was a winner. For this event, let’s plan a little Fiesta Party. This Cheesy Chicken Enchilada Dip takes 5 minutes to put together. Yes, 5 minutes. You can make it ahead and place in your fridge until ready to bake. Serve it with chips or warmed tortillas. Everyone will think you’re the best cook ever, and it’s so simple you can enjoy the game instead of working in the kitchen. Go team. 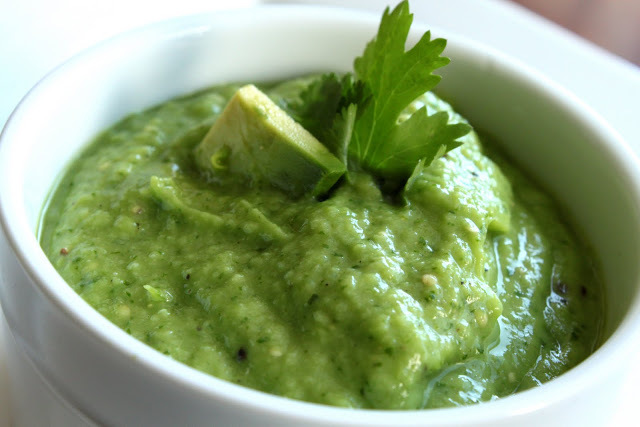 Make some of this Guacamole Taquero, aka Taco Shop Guac, made with tomatillos. A little tangy, very smooth and a nice change from red tomato based salsa. Yummy on eggs (if you have any leftovers). I also love these Southwest Chicken rollups. Perfect with our Mexican flavors party. If you love restaurant salsa, you’ll love Sheri’s simple Salsa. The beauty of this salsa? It can be made in the winter when cans are a better bet than fresh tomatoes. This recipe makes a load of salsa. Perfect recipe for a crowd. Another recipe that takes just a few minutes and a blender or food processor, (or my favorite kitchen tool to bear testimony of) the immersion blender. Take a look at the Mexican Dish category on the index (right side-bar of home page) you’ll find lots of recipes with a Mexican flair for your party! Turn oven to 375 and place rack in center of oven. In a large bowl, mix the chicken, black beans, Rotel, corn (do not thaw), sour cream or cream cheese and 2 cups of the grated cheese. Divide into two- 9 inch pie plates or one 9x13 or similar size baking dish. Top with remaining grated cheese. Bake for 15-20 minutes (uncovered) or until bubbly and cheese is melted. Remove from oven, top with fresh cilantro, chopped green onions and chopped olives. -If using cream cheese, bring the cream cheese to room temperature before mixing in. -If you use Rotel, the finished product will not look quite the same as the photo. The photos on this post included the recipe made with half Rotel and half enchilada sauce. What about the other 2 cups of cheese? Sprinkle on top? Sydney, I think the cream cheese has a richer taste. The sour cream is a bit more tart, and not quite as smooth. But tasty either way! I made this yesterday and it was delicious! However, your picture looks much more red than mine was. I included the Rotel. Do you add enchilada sauce? No I used Rotel in this photo shoot as far as I can remember, but I have subbed out the Rotel and used canned enchilada sauce as well! We love this recipe too! So quick and easy for dinner as well as appetizer. Mine also came out less red and i wondered if i had missed something. I also had quite a bit of liquid in the bottom of the dish. Was i supposed to drain the Rotel? I have made this both ways with and without Rotel! If you use enchilada sauce the dip doe turn out darker red. The Rotel is best drained before baking. I’ll fix the recipe to reflect this. Thanks Margaret!